Inspired by Oliver Evans, Shreve tried to build a steamboat using a high-pressure engine, which was cheaper, smaller, and lighter than Fulton's low-pressure steam engine -- important considerations for shallow Western rivers. This frontiersman helped people travel and trade in the nation's interior by opening up the only viable highways -- American rivers. Henry Miller Shreve was instrumental in the realm of early American waterway navigation. Born in 1785 in New Jersey, Shreve grew up in the Ohio River valley and helped to support his family by trading beaver pelts on the river near his homestead. He became an expert navigator and an adventurous traveler. 1807 marked the year of Robert Fulton's successful steamboat experiment. Within a few years, Shreve had designed his own, the Enterprise. 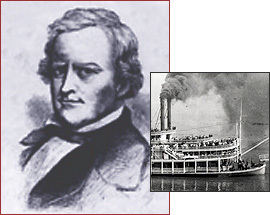 Seeking his own business opportunities, Shreve legally challenged Fulton's monopoly of the Mississippi River steamboat trade. The monopoly was broken in 1817, five years after the Enterprise had helped win the Battle of New Orleans in the War of 1812. Although the public was wary of volatile steam engines, trade increased on the nation's waterways, slashing cargo costs and communication times between settlements. In 1826, Shreve was appointed superintendent of western river improvements, a post he would hold until 1841. One of the problems Shreve faced was that tens of thousands of "snags" -- huge tree limbs and trunks in the rivers -- caused frequent accidents. Shreve designed a steamboat, the Heliopolis, that had a jaw-like device on its bow to pick up and remove snags to a sawmill on the boat's deck. Snag boat operations, funded by the government, made navigation of the nation's rivers safer and much more economical. Furthermore, some debris-choked waterways that were blocking the progress of westward expansion, such as the Red River, became navigable because of the snag boat. A town on the that river, Shreveport, would be named after Shreve, and become one of Louisiana's largest cities. Shreve died in 1854.